n 2015 for only the second time in history, the Royal Mint released a British Lunar Year of the Sheep £2 Two Pound Silver Proof Coin struck in solid fine .999 Silver weighing one ounce of fine pure Silver and is part of the Shengxiao Collection. The obverse features Ian Rank Broadley's portrait of Her Majesty Queen Elizabeth II. 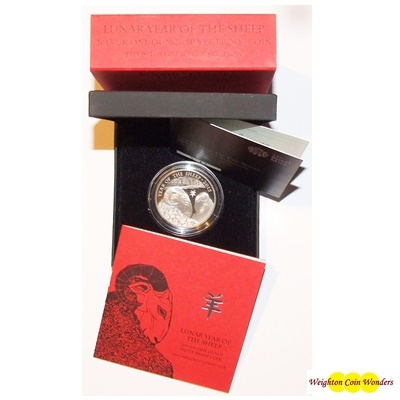 Housed in Royal Mint Presentation Box with Certificate of Authenticity and Information booklet.